Special barrenwort selection with some of the largest flowers in the genus that we grow. 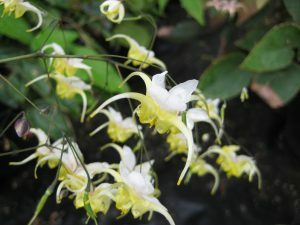 Arching flowers are pastel white and yellow and appear most profusely around easter time. Long long blooming from April into July. Tightly clumping perennial for RICH, well drained soil with regular moisture in part shade to full shade. New growth is mottled in red before settling to medium green handsome leaves. Plant with Omphalodes, Primula sieboldii cvs. and Vancouveria chrysantha. To 10″ tall and clumping.